What is an Oregon Sublease Agreement? Oregon Sublease Agreement: What Is It? A sublease agreement occurs when the tenant of a rental no longer wishes to remain in the property and finds a new tenant to take his or her place. This exchange can be for a short period of time, or for the duration of the lease. The tenant who will be leaving, known as the Sublessor, must have the landlord’s permission in order for the incoming tenant, the Sublessee, to legally move in. These types of arrangements occur for all sorts of reasons. The most common are military deployment, family emergencies, and job relocations, however, subleases can occur for any reason. 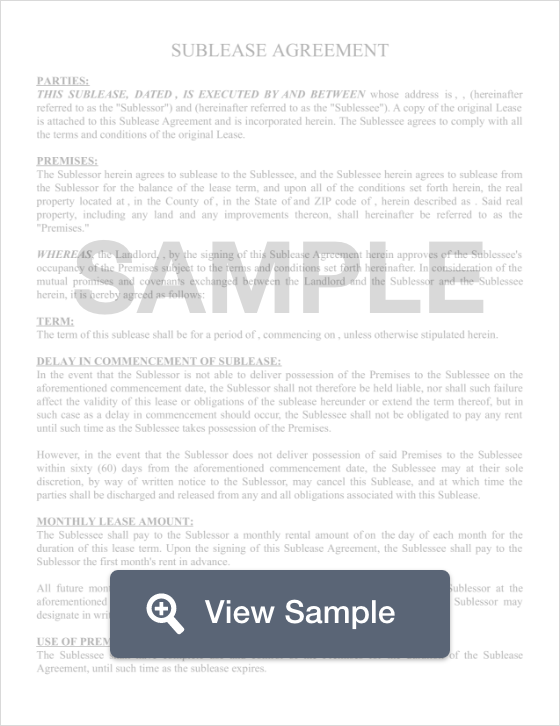 Though a sublease agreement is a legally binding contract, the Sublessor’s name remains on the original lease with the landlord, and he or she would be held responsible should any damage occur while the sublease agreement is in place. Oregon Tenant/Landlord Law dictates that a sublessor must have written approval from a landlord in order for the agreement to proceed. This agreement must be signed by the landlord, the sublessor and the sublessee agreeing that the sublessee will follow all the rules of tenancy and pay rent on time.